We tend to think of physical activity as mainly affecting our physical as opposed to our mental health. However, the more we understand the close connection of mind and body, and the more research that is done exploring the relationship between mind and body, the more the topic of physical exercise comes to the fore. What does exercise mean to us? For some it may bring to mind enjoyable or fun physical activities, such as walking the dog or playing sport with friends. For others it may conjure up the image of something demanding – perhaps something that we are meant to do, but which will take more time or effort than we might think we can readily manage. In the health field exercise is increasingly being recognised as being not only a physical health intervention, but also a mental health intervention for conditions such as depression. Being physically fit not only substantially reduces the risk of physical and mental health problems, but serves as a mental health asset. It typically leads to such benefits as improved mood, better sleep, reduced stress reactions, feelings of competence and achievement, improved memory and speed of cognitive processing, improved cerebral blood flow and enhanced brain chemistry owing to increased endorphins and serotonin. The increasing attention given to physical exercise in the mental health field is partly because of an increasing interest in neurogenesis, or the capacity to form new brain cells throughout the entire life span. Physical exercise is a key means of increasing the production of new brain cells in the hippocampus, a structure in the brain that helps consolidate new learning and memory. Other things that assist neurogenesis include novel experiences and states of heightened and focussed attention. Exercising helps us to form new neurons, but approximately half of those new neurons may be soon lost if they are not consolidated by new learning. Therefore, a combination of physical exercise and new learning, or exercising combined with spending time in stimulating and engaging environments, can enhance neurogenesis. The neurogenesis effect itself provides one reason why exercise may help with depression. Some people speculate that depression is partly caused by a relative “shutting down” or curtailing of neurogenesis. But apart from this, there is considerable evidence that physical exercise of approximately three hours per week can alleviate depression as effectively as many conventional therapies. This includes both aerobic exercise, such as walking, jogging or cycling which involves lower intensity exercise over longer periods of time, or anaerobic exercise which involves brief periods of intense physical effort. There is some evidence of a dose-response relationship whereby more vigorous physical activity leads to greater benefit for depression than moderate physical activity. Those who engage in regular physical exercise are less likely to experience anxiety and depression. This is true for people of all ages. For example, children aged 8 to 12 years who are relatively inactive are approximately three times more likely to suffer from depressive symptoms. With regard to depression, three hours of exercise per week for at least six weeks to two months has been found to be an effective intervention, especially for mild to moderate depression. For depression there is likely a particular benefit from higher intensity exercise which in some studies has shown equivalent effectiveness to many other treatments including medication and therapy interventions. It is likely to provide additional benefits when such standard interventions are already being used. There is some evidence for a dose-response relationship, meaning that higher levels of exercise have a greater impact in preventing and/or alleviating depression. • for older adults at risk of falls, engage in activity on at least two days per week which promotes balance or co-ordination. Moderate physical exercise leads to moderately faster breathing and increased heart rate: it includes such activities as walking, vacuuming, and playing doubles tennis. Vigorous physical activity leads to much faster breathing and rapid heart rate: it includes such activities as running, cycling, swimming and singles tennis. People are also advised to engage in exercise which would be the equivalent of walking 10,000 steps a day. Buying a pedometer can be a great step toward achieving this goal. 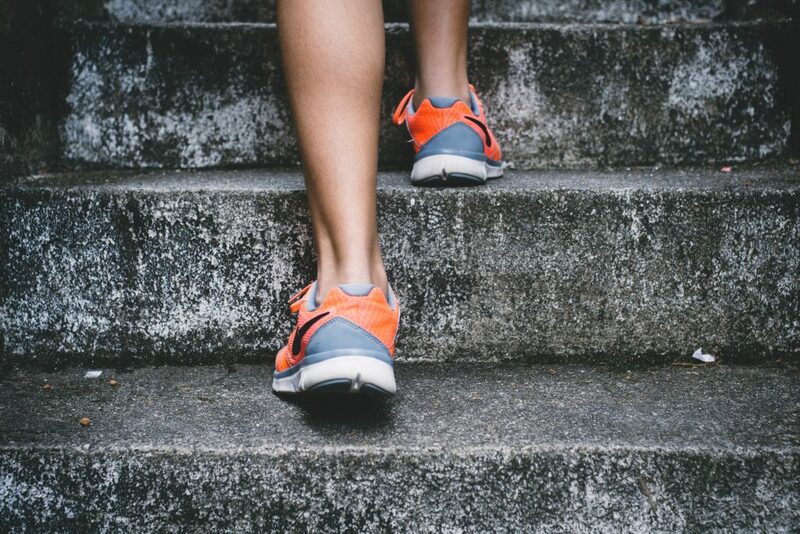 Those who engage in exercise the equivalent of less that 5000 steps a day are much more susceptible to a range of health risks including increased risk of mortality. These guidelines are recommended for all health professionals to promote to clients for a wide range of health-related issues. Our mental health is strongly influenced by our perception of our physical health. The latter is improved by the physical health benefits of exercise. In order to increase and maintain one’s level of physical fitness through exercise, it would likely help to choose activities which are more readily accessible and which are likely to be enjoyable. It sometimes helps to find an exercise buddy or choose activities which involve the company of others. By being aware of the significant physical and mental health benefits which result, as well as by mindfully paying attention to enjoyment from the activity itself, we are more likely to continue the activity as a satisfying part of our everyday life routines. It commonly takes a period of at least four months to establish new habits or routines. If we slip up in our attempts to do so, it is often best to simply acknowledge the lapse, remind ourselves why we are making the effort to establish the routines in the first place and then renew our efforts. Again, this is easier when we choose activities which are more readily accessible and likely to be enjoyable or more readily rewarding.